The lowest ranked Indian after the ranking rounds, Laxmirani Majhi, was the first to take part in the individual 1/32 elimination round. Majhi took on Slovakia's Alexandra Longova. In what was another blow for India, Longova outplayed Majhi 7-1 at the Rio Olympics on Monday, 8 August. Out of the four sets, Majhi could not even win one against her much fancied opponent. Majhi lost the first set 25-27, second set 26-28 and under immense pressure in the third, Majhi scored a perfect ten in her final shot to level the set at 26-26. By the time the two entered the fourth set, the score read 5-1 in favour of the Slovakian. The 27-year-old Indian failed to capatalise on her third set draw and began the third set with a seven. She finished the fourth set on 24 points, three less than Alexandra's 27. With that, Majhi's Olympic campaign came to an end. In the elimination round, each archer shooters three arrows in each set. The winner of each set is awarded two points. If scores are level at the end of a set, then the points are split. The archer who reaches six points first, wins the match. 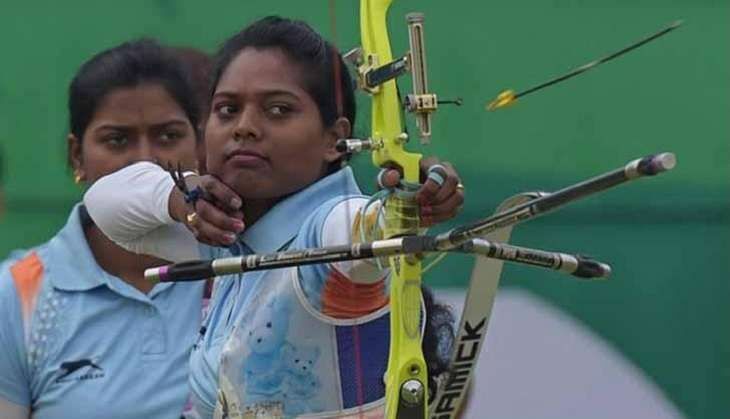 On Sunday, 7 August, the Indian women's team comprising Laxmirani, Bombayla Devi and Deepika Kumari lost in the quarterfinals to Russia in a shoot-off. On Wednesday, 10 August, Bombayla Devi will feature in the same event at 18:09 IST. For Indians, Deepika Kumari will feature a couple of hours later, on Thursday, 11 August at 01:27 IST.